Over the past few decades, an evolution in how we go about training horses has encouraged horse owners to spend more time handling their horse on the ground in order to achieve good behaviour, mutual trust, and a healthy partnership before they ever think about getting in the saddle. This has created a generation of horsemen and women perfectly poised to pursue the competitive and social benefits of the sport of Horse Agility. Horse trainer Vanessa Bee, founder of the International Horse Agility Club, says that we need to change the way we think about horses and the sports and activities we so often pursue with them. She sees no reason the horse cannot enjoy your time together so much, he will choose to play with you over, under, and through obstacles, without a lead rope, even when loose in a large, grassy pasture. Hard to believe? Try it for yourself! 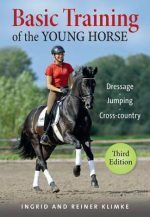 The Horse Agility Handbook has all you need to get started in the sport, including lessons in handling and body language, directions for obstacle and course construction, and information for managing competitions and play days . About the Author Vanessa Bee is the founder of the International Horse Agility Club (thehorseagilityclub.com). With a training facility in England and her own method known as Positive Horsemanship, she specialises in building relationships between the horse and the handler from the ground up. Vanessa has been around horses most of her life, working in racing stables, then driving competitively in her early twenties when she was given an unrideable racehorse as a wedding present. She soon discovered that there are many ways of teaching horsemanship. Vanessa developed a series of courses that teach people of all abilities to achieve a positive relationship with their horse. By creating the Club , she provided a social and competitive outlet for those relationships to grow. Her previous title include 3-Minute Horsemanship (JA Allen).